The service launched yesterday in India in the midst of the Warner music conflict, but it seems to have a pretty decent catalogue in India. The recommendations engine is also top notch as I experienced it first hand by feeding in my preferred artists across different genres and it right away created a bunch of playlists with some of my favorite songs. Definitely the best experience of all the music streaming services so far for me. I’m currently on the free tier which doesn’t lose out much other than the highest audio quality and offline storage. The ads are bearable for now. It also seems that Amazon is holding back with their Spotify support on the Echo line in India as seen in this mail from customer support. The premium pricing is also in line with Apple Music though quite a bit more expensive than the Indian services like Wynk or Saavn. It also doesn’t seem to support in app purchases on iOS as evidenced below. I’ll probably go for the premium subscription once the Echo support kicks in or I require the offline access. For now, happy with the free tier of Spotify and making do with Amazon Music on the Echo. Got my first smart speaker, the Amazon Echo Plus yesterday and it seems to be nicely Indianised. It seems to be using the Raveena voice based on Indian English or a variant thereof from Amazon Polly (AWS’s text to speech service). 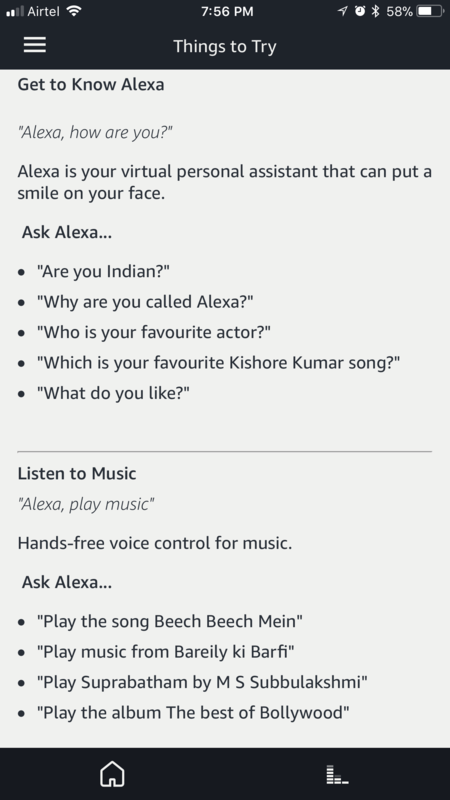 The Alexa app itself is also pleasantly adapted for India with the appropriate command suggestions and services available. I had pre-ordered the device and it was delivered within a day of the dispatch. The setup process was quite smooth and once done, I promptly went about installing a bunch of skills ranging from the utilitarian to the time pass ones. As a music player, the sound quality is decent but nothing spectacular as many reviewers have noted. As for the music catalog, it seems to be using Saavn exclusively though it does Amazon music as one of the options in the app. 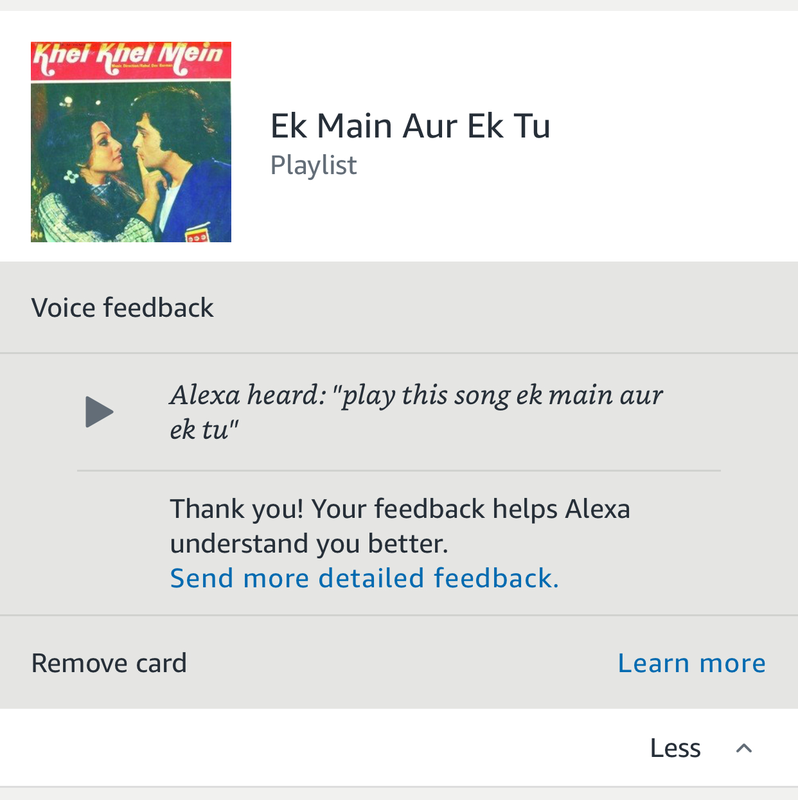 Saavn itself has a decent catalog and Alexa has again been Indianised sufficiently to understand some Hindi song names. I tried “Play the song ek main aur ek turn” and it actually started playing the song from Saavn though it did pronounce “main” the English way. The flash briefing skill is quite handy to get a quick bulletin of your areas of interest once you have set it up with your desired sources. It can also give you cricket score updates without any skill installation as I tried out during today’s India – New Zealand match. I installed the Uber and Ola skills to check the overall utility factor. While Alexa seems to be able to book an Uber including picking up your location, the payment mode defaults to cash which is a dealbreaker for me. Then there’s the Zomato skill I installed and tested. It seems to know your last 3-4 orders and you can reorder as well but didn’t go beyond browsing for the moment. The alarms and timers work pretty well too and I conveniently set a sleep timer to stop playing the music while going to bed. Then of course there’s the whole reason why I got the plus instead of the regular model which is the smart home hub built into the device. A solo Philips hue bulb is what I ordered next and setup today. It was again a pretty simple process with the Echo detecting the bulb in a few seconds. Controlling the bulb by voice is also quite easy right from switching it on and off to changing the colour and brightness. The app however has just the on/off switch and brightness control at the moment and as many reviewers have noted, the functionality of the smart devices using just the Echo Plus is considerably limited when compared to using the devices with their respective hubs. This is definitely one area of improvement and given the kind of coverage you see for smart homes on the Amazon Alexa pages, it should improve sooner rather than later. Apart from all this you can also use the Echo as a Bluetooth speaker and pairing it with my iPhone was quite simple. That said, all the sounds from the phone start getting carried over to the speaker and this interrupts any song or speech playing on it directly. Due to this, I ended up keeping the phone disconnected unless I wanted to play something from my phone. One thing I couldn’t find is the voice profiles option that lets Alexa identify the person speaking and customising the responses accordingly. Possibly a feature not yet rolled out to the Indian market as it seems to depend on the Amazon app that didn’t seem to have this option in my case. A smart speaker is a family device but my wife is not very enthused by the idea while my 4 year old daughter would like to play with Alexa but hasn’t yet gotten out of her initial shyness phase to begin talking freely to her. It didn’t help that Alexa couldn’t answer many of her queries and also the fact that she was trying to get Alexa to identify the colours of the crayons she was holding in front of the device – a perfect case for Google Lens and Assistant. 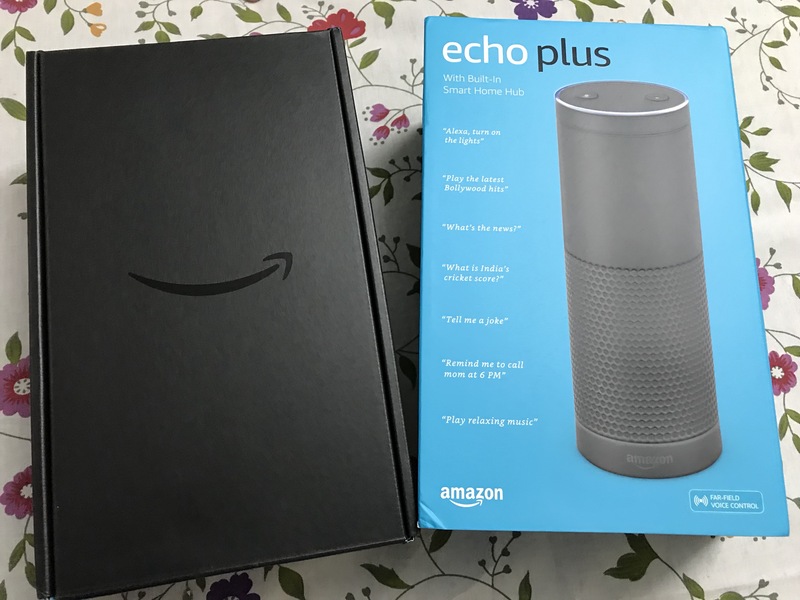 This is of course just what I’ve been able to check out in the first 24 hours with the Echo Plus and I’m sure there’s lots more already available and also coming in the near future. I was one of the late backers of the Pebble Time smartwatch, and finally received it today. I backed it after the Apple watch event in early March and deciding that the first gen Apple watch was a bit too expensive for me. I also got lucky with the Pebble Kickstarter campaign and managed to switch my initial pledge of $169 to the early bird $159 when people had started backing out towards the end of the campaign. The shipment was delayed by nearly a month, but that’s not too bad by Kickstarter standards, and as I had opted for the expedited option with prepaid duties and taxes, I received my package within a week of dispatch. I did have to stay in regular touch with the DHL support, first for the KYC documents and then for the description letter to the customs team. There was also the currency goofup on the invoice with labels in EUR though the payments had been in USD. This was something many of the Indian backers who received their packages before me had observed on the campaign portal. Fortunately for me, the DHL team seems to have managed to sort out these issues with the customs to ensure that I received the package just a day later than their estimate. Anyway, coming to the Pebble Time, it is definitely quite lightweight and pretty comfortable to wear. The silicone strap seems quite comfortable as well and the material feels just like those silicone cupcake moulds and other similar kitchen accessories that one sees in stores. As for the display, it is fairly colourful, but a bit dim even with the backlight as many reviewers and users have observed. It is especially problematic in the current monsoon season with cloudy skies most of the time. That said, I’m sure app and watchface developers will start optimizing their products for the display in the coming months to improve readability. The double bezel is also on the thicker side by modern gadget standards, but haven’t found it to be very distracting so far. As for the coating on the steel frame, I suspect Pebble might be facing the same durability challenges as Apple did with the iPhone 5 black version, given the scratch reports from early users. I opted to pair the Pebble Time with my iPhone 5s instead of the Mi 4, and loaded a bunch of apps and watchfaces on it including the PebbUp watchfaces that I’d backed on Kickstarter. The notifications have been trickling in since the pairing as well and the vibration is fairly gentle. I’d already done some notification management on my iPhone, so haven’t been getting flooded thus far, and even cricket scores are showing up thanks to the ESPNCricinfo app alerts. I also did a full charge of the Pebble while installing the apps though it was well over 60% when I got it. It charged up pretty quick even from a laptop USB port. Also, no faulty cable. Some of the other things I’d like to test in the coming weeks are Android support and voice replies, fitness tracking (already installed some apps), usage at work (currently working from home with a broken arm) and of course the battery life. In the meantime, checkout the unboxing and initial setup photos below.